Create your own car detailing shop and save space. No more bulky canisters or complicated installations. The GarageVac installs in as little as 10 minutes and takes up half the wall space of other garage vacuums. Designed with the garage in mind, GarageVac helps you organize your space and gives you all the tools you need to keep it clean. There's no need to be confined to the garage with your GarageVac unit! Our wall mounted option makes GarageVac portable. Just take it off the wall when you're heading out in the RV or Boat. Use it in the cottage or cabin or inside the home in the utility room or bonus room. The options are endless with GarageVac. 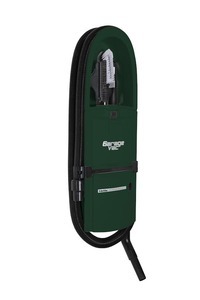 GarageVac comes with our unique 40 foot stretch hose that shrinks to just 8 feet for easy storage, a non-corrosive adjustable one piece wand, upholstery brush, crevice tool, bare floor tool and elongated dust brush that cleans your whole dashboard with just one swipe! Just wrap the hose around the power unit and store the tools neatly inside. Then GarageVac is always at your fingertips for any job, not matter how large or how small. HEPA type filtration is standard with GarageVac so no dust or allergens are ever exhausted back into the garage. Each bag holds an incredible one gallon of dirt and is super simple to replace. Just push up the latch and remove the door with your bag still attached. No dust to fly up in your face like when you empty a central vacuum canister. GarageVac is the most compact and lightweight central vacuum cleaner on the market. The wall mounted model GH-120 GarageVac saves valuable floor or wall space and keeps the vacuum tools at your fingertips. You won't loose any tools or misplace the hose everything is in one spot ready to clean. It takes about 10 minute to install. Includes our unique 40 foot stretch hose, adjustable telescoping aluminum wand, crevice tool, dashboard brush, upholstery tool and floor tool. The unique stretch hose shrinks from forty feet to just eight feet for easy storage. All GarageVac accessories are designed for optimal space saving. It is supplied with a 5-1/2 foot electric cord. 400 air watts, 100" H20 water lift. Front Panel: 9 1/2" wide x 29 9/16" high x 4" depth. Is GarageVac a wet/dry system? How long will it take to install my GarageVac? GarageVac couldn't be easier, it only takes a few minutes. Just 4 screws are needed to securely mount your GarageVac to the wall. What is the advantage of a GarageVac? Our patented design makes GarageVac the most compact, yet powerful garage vacuum on the market. The integrated tool caddy provides storage for all your accessory tools and a convenient hose hanger for the 40 foot stretch hose. There is no need for bulky cannisters on the wall that require additional wall space for the hose and tools. Take back more of your garage for what you want and let the compact GarageVac clean up the mess. How powerful is the vacuum cleaner? It has a 12 amp motor with 100 of water lift. 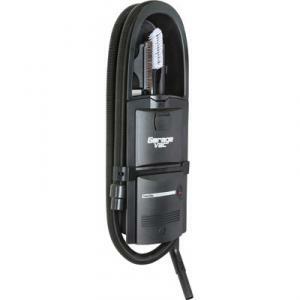 This compares favorably with any top quality upright or canister vacuum. How much dust does the bag hold? 8 pounds or 1 gallon, depending on the type of debris. The patented vacuum chamber allows the bag to fill completely without collapsing, thereby utilizing the entire bag. What type of filtration does interVac have? GarageVac comes standard with a HEPA type filtration system. No other Garage vacuum cleaner offers this high a standard of filtration. If I have a surface mounted unit, can I use it in other places? Yes, it is the only garage vacuum that can also be portable. So now you can move your GarageVac between the home, RV, boat or cottage. Would I need any special tools to install my GarageVac? A simple Leatherman tool can be used. All GarageVacs come with a six year warranty and extended warranties are available. Can I vacuum up water? No. GarageVac’s are not designed as a wet/dry vacuum. Where does the air discharge? The air discharges from the bottom of the unit. With GarageVac's high filtration system you can be assured that dirt will not be returned into your garage. Always check the filtration rating on ANY vacuum cleaner you purchase! I like a standard central vacuum hose. Why do you sell the stretch hose? Each hose has its own merits. Standard central vacuum hose is lighter weight but it is inconvenient to store. With the stretch hose, it is quick to connect, making it ideal for high traffic areas and quick clean ups, and it shrinks to just 8’ so it is simple to store. How does your vacuum cleaner compare with a standard upright or canister? 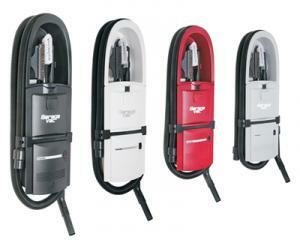 GarageVac units have more suction power than most of the standard vacuums in retail stores. My vacuum cleaner stopped running. What should I do? The most common cause is a clogged hose or floor tool, so check that first. The motor is protected so it cannot burn up and will require about an hour to reset.